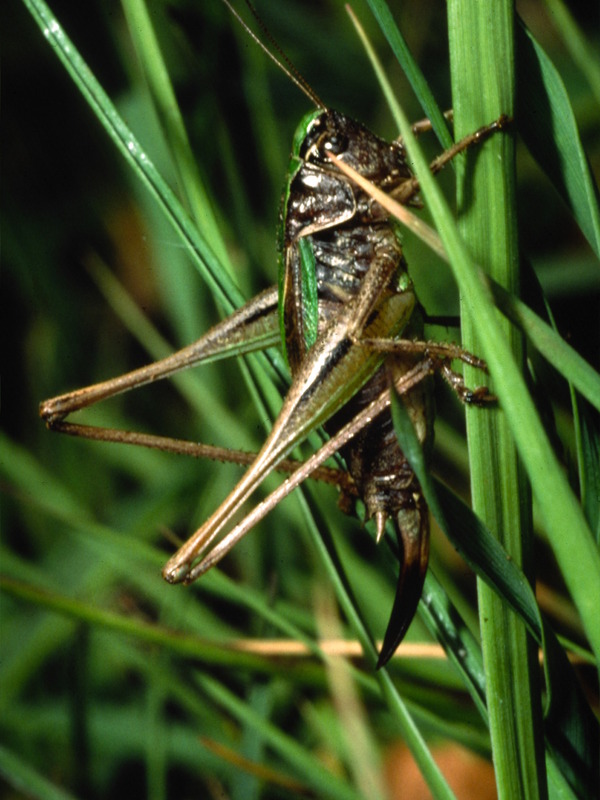 One of my lesser known roles is as the county recorder in Devon for grasshoppers and cricket, collectively known as orthoptera. Every now and again I get an email from the Devon Biological Records Centre asking me to identify or confirm the identification of an orthoptera from a photograph. A couple of weeks I was forwarded an email from a man, Stan Williams from Derby who had been on holiday in the south of Devon. He had photographed a bush cricket and had spent some time ‘googling’ it and had concluded it was a Southern Oak Bush Cricket. He had contacted the Record Centre as he thought they might be interested. 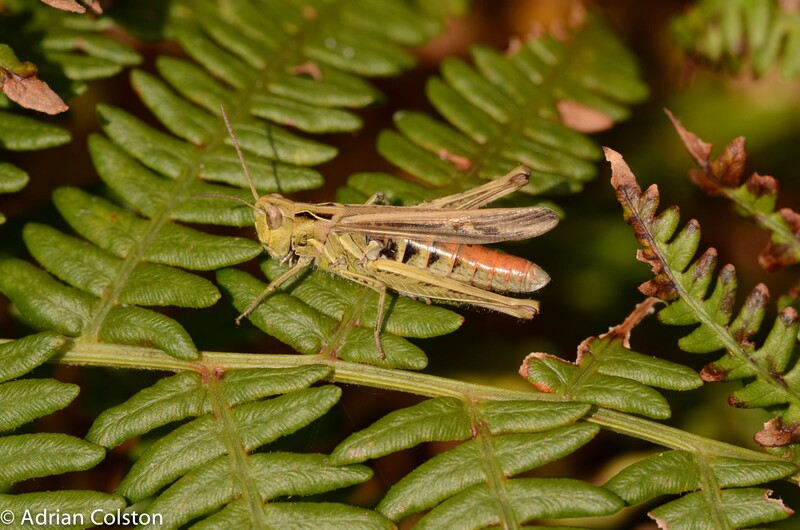 This is a very interesting record and as a result I wanted to confirm the identification with the Orthoptera National Scheme co-ordinator Peter Sutton. He has now got back to me and is happy with the ID. 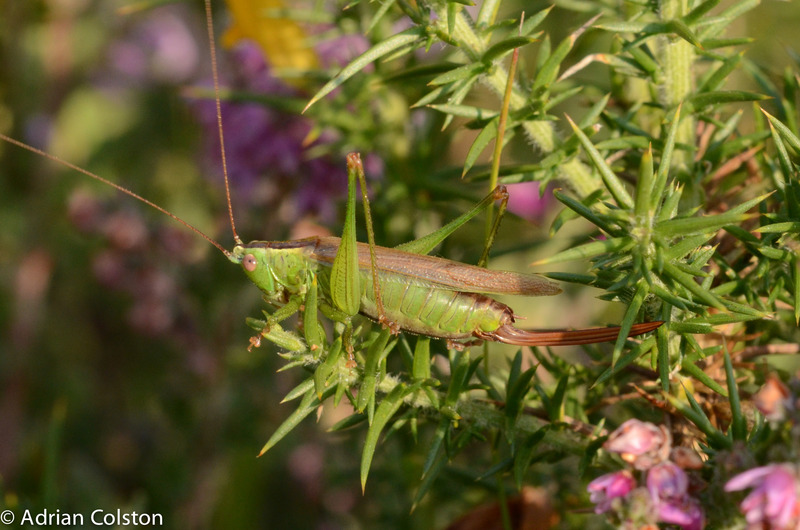 It is an interesting record because the Southern Oak Bush Cricket (Meconema meridionale) is a newly naturalised species in the UK, first arriving in Thames Ditton in Surrey in September 2001. It is now spreading throughout southern Britain. Stan Williams’ record is the first record for Devon that I have received. He found it on his car in the car park opposite St Mary’s Church, on Church End Road, in Kingskerswell during the week commencing the 17th October. He had previously visited Stover Country Park but he doesn’t think it was on his car when he left. Mr Williams has kindly allowed me to use his photograph. It is a male, it has a distinctive colour and classic brown yellow marking on its back. The key feature however is that it has tiny short wings. 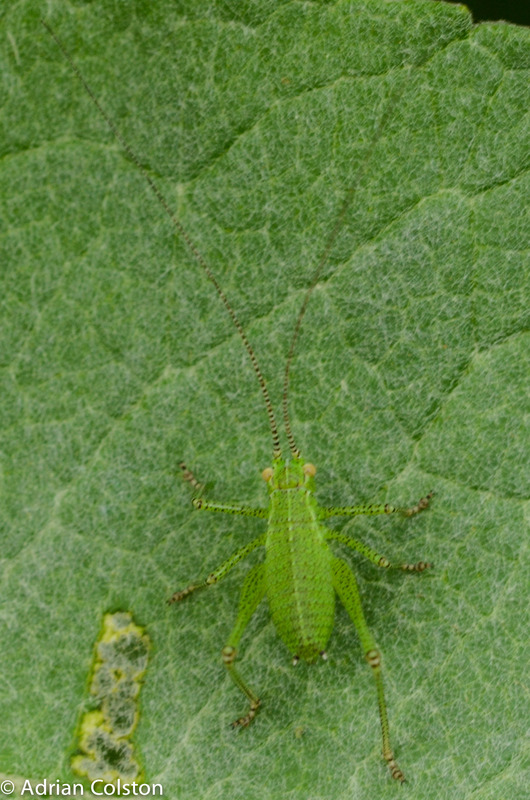 Here is a photo of the Oak Bush Cricket (Meconema thalassinum), also a male – which common in the UK – note it has a similar colour and markings but it is fully winged. Thank you Stan for having the foresight to photograph the species and send the record in. 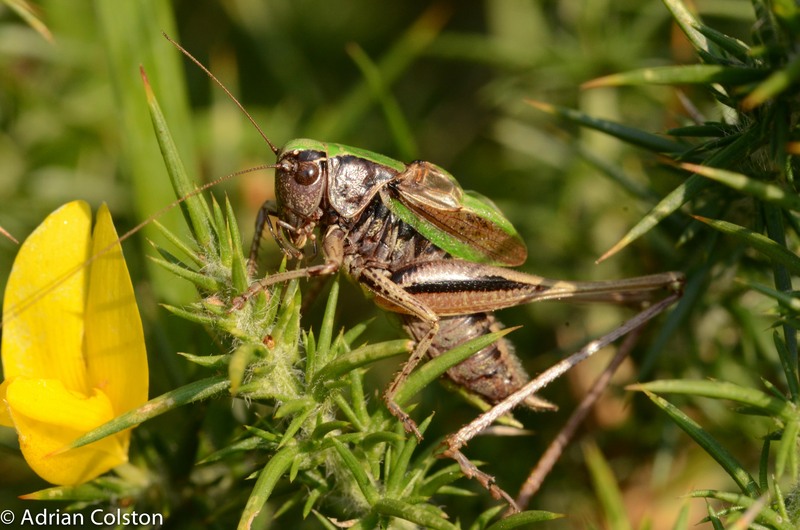 As a result Devon has a new species of bush cricket and next year we will have to see if we can find any more. Insects fall into two main ‘divisions’ when it comes to their development from egg to adult. In some insects such as butterflies, moths, beetles and flies, eggs hatch into larvae (sometimes called caterpillars or maggots) and these then metamorphose via a chrysalis (or pupae) in the adult animal. Other insects such as grasshoppers and crickets develop gradually – when the egg hatches the individual looks like a mini version of the adult and then gradually grows shedding its exoskeleton via series of instars. 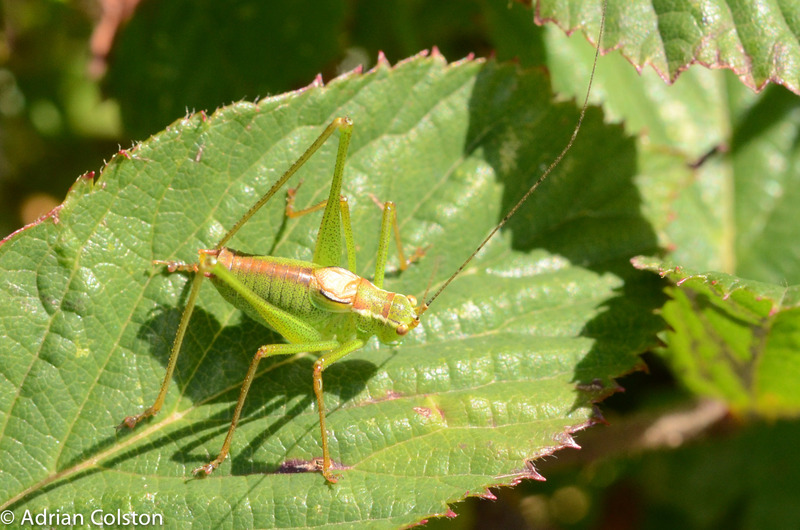 This is an adult (final instar) speckled bush-cricket photographed in the same place last summer. It is around 16mm in length excluding the antennae. 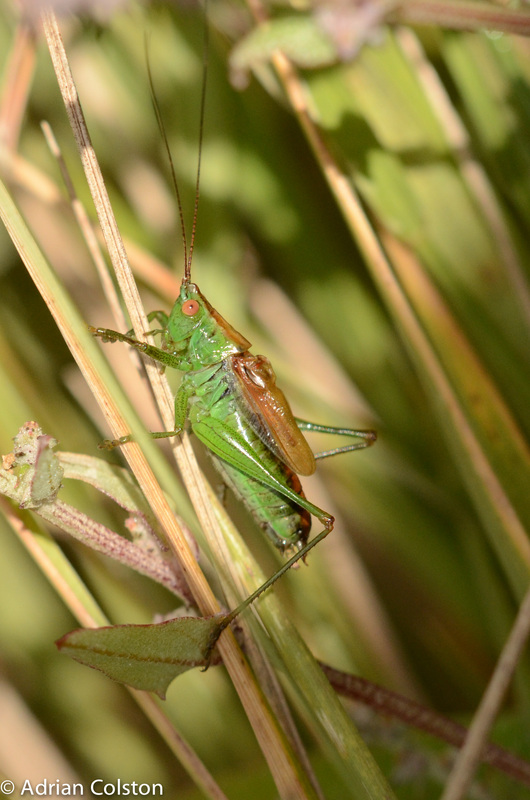 Bush-crickets can go through up to nine instars before adulthood. 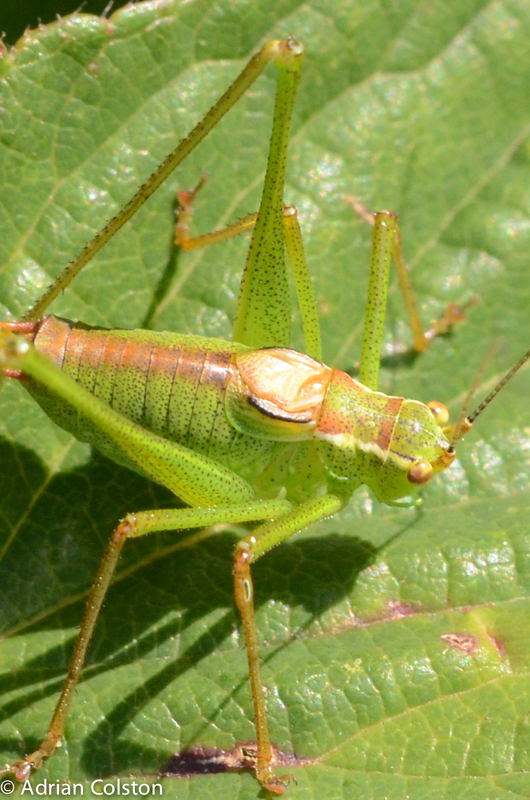 A close up shows why it is called the speckled bush-cricket. 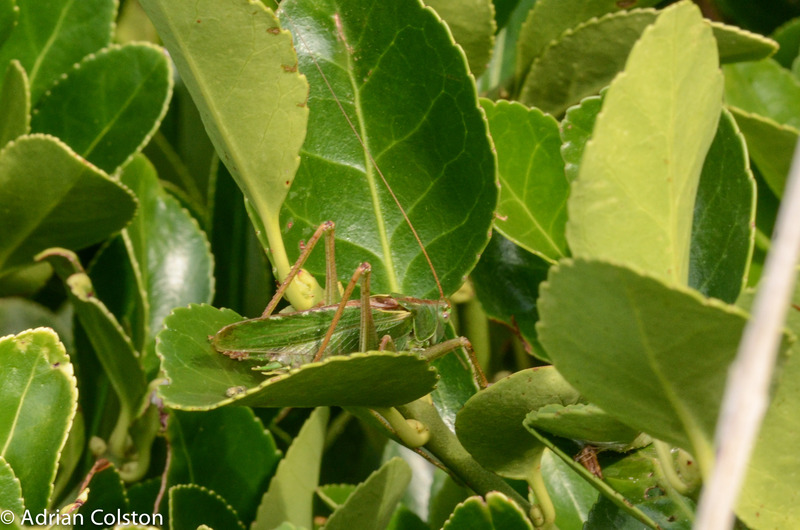 Speckled bush crickets are very common animals but aren’t necessarily seen that often as they are rather good at camouflaging themselves. I found this one at Hembury Woods last week. 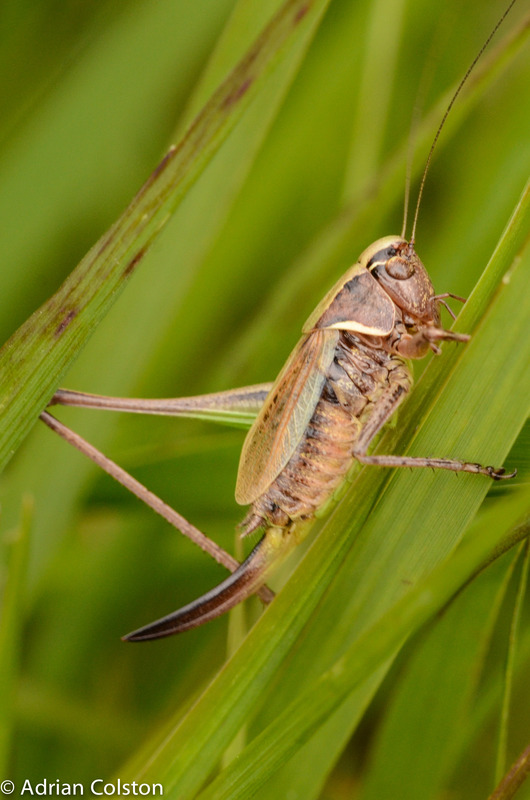 Bog bush crickets – doing well? 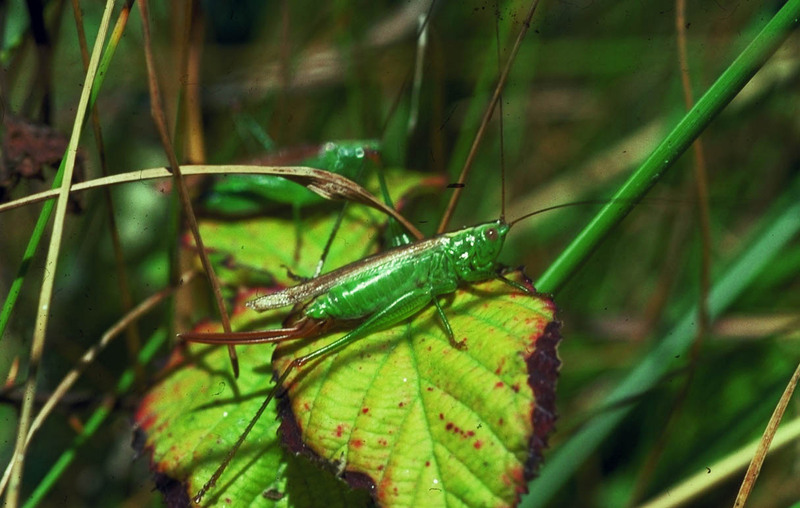 The bog bush cricket is a pretty rare animal nationally and one of its strongholds is south east Dartmoor and its hinterland. 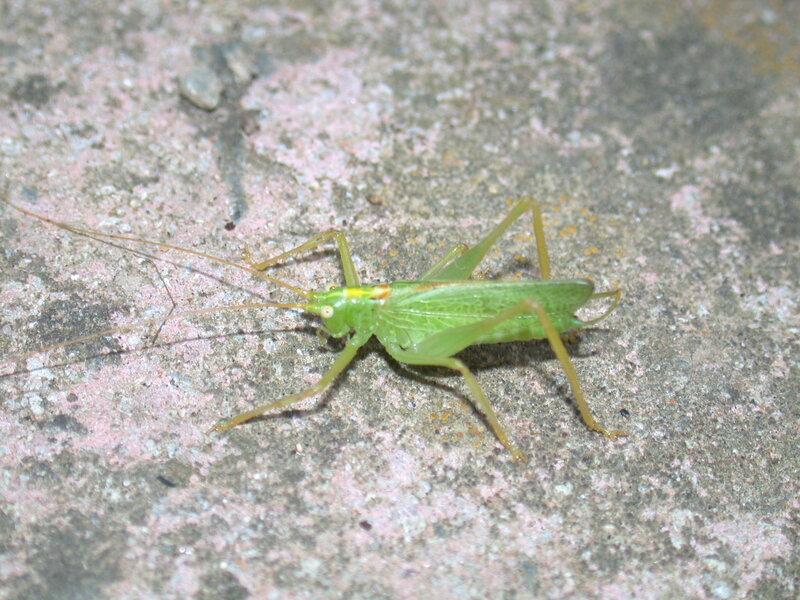 There are two colour forms – a brown animal with a green line on the underside of the abdomen and a brown form with green lines on top and underneath. They are pretty smart looking animals! 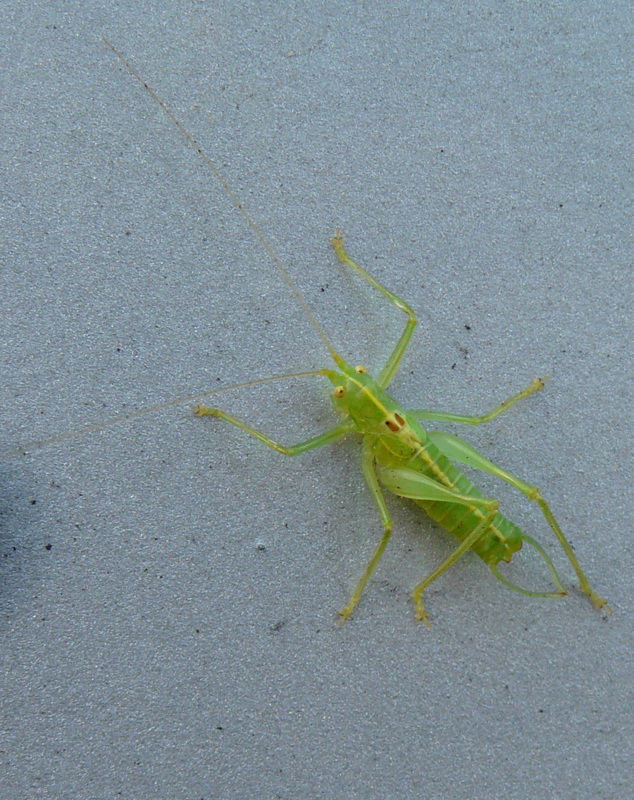 Here is a male with green on the top of the body – you can clearly see the reduced wings which are used to stridulate i.e. make the characteristic buzzing noise – when I photographed this individual at Chudleigh Knighton Heath (the Devon Wildlife Trust reserve) I could clearly see the wing cases moving. 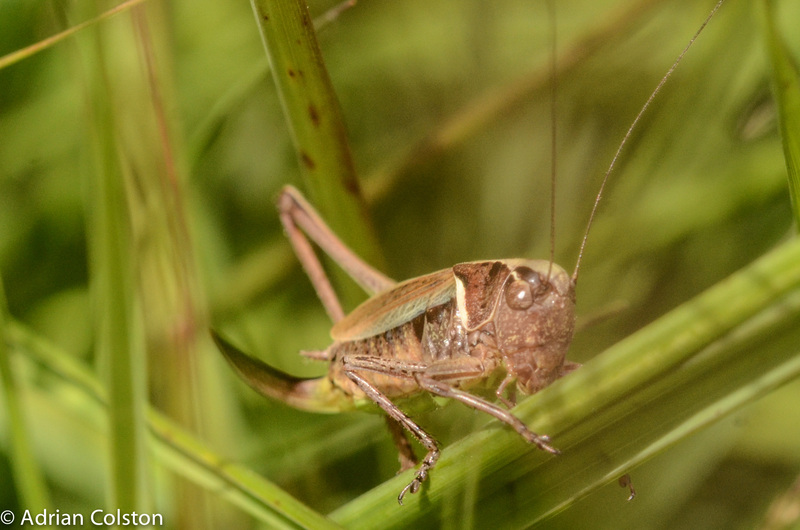 Bog bush crickets are secretive animals and can be difficult to find. However using the bat detector their inaudible high frequency calls become audible and are a real help in locating individual males. 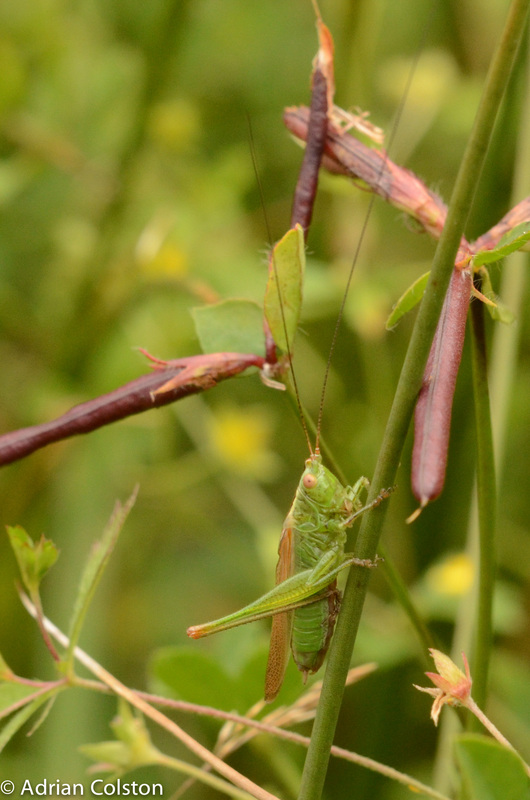 One thing that has been obvious on my last few bog bush cricket trips has been the prevalence of another species – the long-winged cone-head in the same habitat. 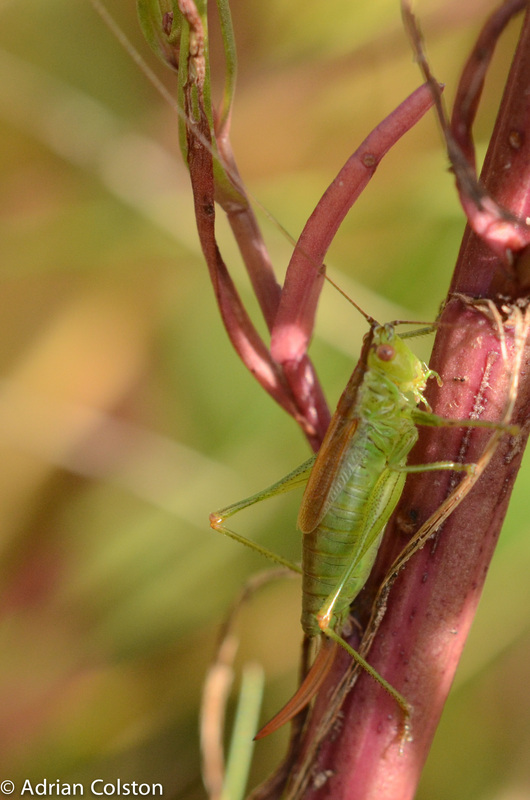 This is interesting as prior to 1990 long-winged cone-heads were absent from Devon (see here for the distribution maps) – on Chudleigh Knighton heath I would estimate that the cone-heads outnumber the bog bush crickets 3 to 1. – their heads are shaped like a classic seaside ice cream cone! 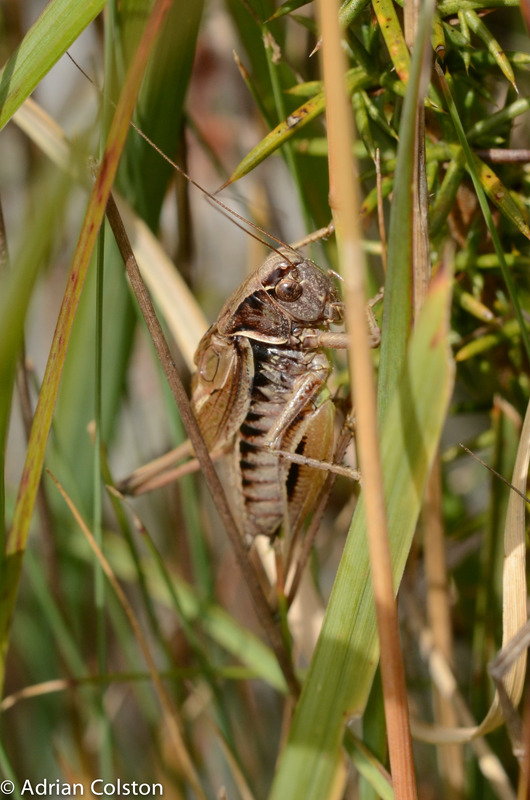 Bog bush crickets appear to be flourishing and are common at their classic sites but I do wonder whether the cone-heads are having / might have an impact in the future- I guess time will tell and monitoring of their progress will be required. 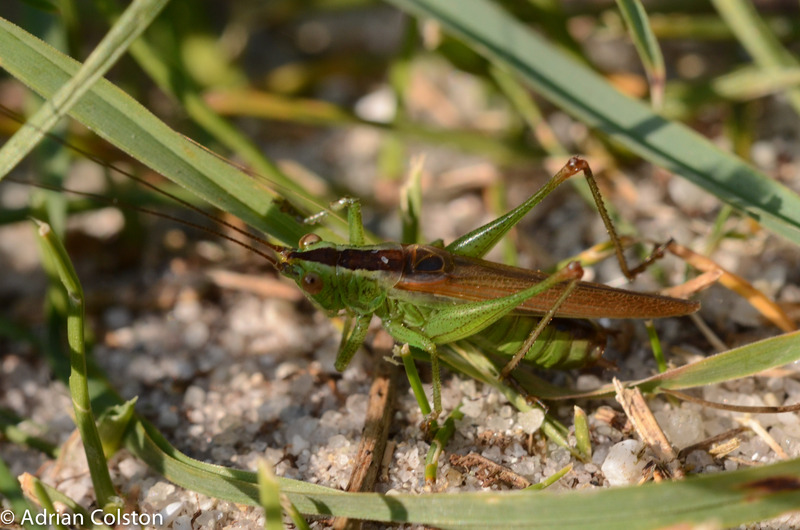 I mentioned in a previous blog that you can tell different species of bush cricket and grasshoppers by their songs. I have recorded the songs of our two species of cone head bush crickets to demonstrate this. Their songs are very high pitched and quiet – so to make them audible I have used a bat detector which makes the high pitched noises audible via the clever electronics in the box. 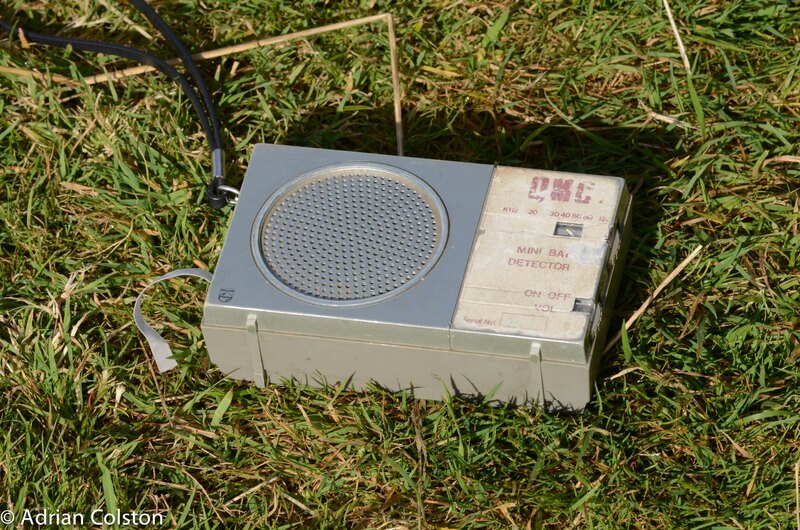 I used an old QMC bat detector set at a frequency of 40 KHz. – its like a vintage tractor chugging along! And here is the song of the male short winged cone head – recorded yesterday – its like a vintage tractor which changes gear as it goes along.